From 18-22 September 2019, Zermatt will celebrate its love of biking with the second year of the Traillove Alpine Mountain Bike Festival. Featuring the final stage of the Enduro World Series Mountain Bike Championship and the Chasing Cancellara Zurich-Zermatt bike race, the festival will offer two top-quality events. This year will also include a very special biking adventure – the "Traillove Derby". After its successful first year, the Traillove Festival 2019 will be even bigger and better, with a wide range of new events. This new festival aims to combine the best of cycling and mountain biking with unique Alpine scenery, offering a broad programme that will excite any two-wheeled enthusiast. 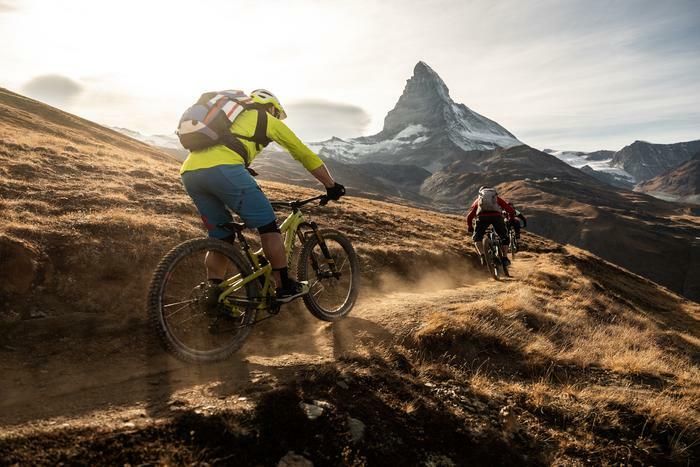 It's time for something new: The Traillove Derby introduces a new format into the festival, offering participants a fun, imaginative way to experience all the biking excitement the Zermatt – Matterhorn destination has to offer. Over three days, 50 two-person teams will take on various challenges, discovering the best trails and hidden corners at the foot of the Matterhorn. There will also be Zermatt cuisine, a lively evening programme and plenty of chance to socialise. Thanks to the all-inclusive package, the derby teams can focus all their attention on biking. Traillove brings people together. It is highly likely that mountain bike pro Sam Hill and road racing cyclist Fabian Cancellara will meet in Zermatt. The start of this year’s festival and the Traillove Derby will be signalled by the arrival of the Chasing Cancellara participants on Thursday 19 September 2019. Beginning in Zurich at the Prime Tower, Olympic champion Fabian Cancellara and around 500 pursuers have almost 290 kilometres and 7000 metres of ascent ahead of them before they reach the Matterhorn in Zermatt – a true Ultra Fondo. The final stage of the Enduro World Series Mountain Bike Championship reaches its literal and metaphorical peak on Saturday 21 September 2019, when the Series champions will be crowned in Zermatt. The individual stages take place close to the village and are easy for spectators to reach. The festival hub will be located in the centre of the village, ideal for experiencing the Enduro World Series atmosphere up close. The closing party on the Saturday evening is a must for everyone. In addition to these highlights, there is also a fantastic supporting programme. This year, the Brand Village and the range of test bikes will be expanded and there will be a special test track for testing e-bikes. The last day of the festival is all about the kids, with the Traillove Family Day on Sunday 22 September 2019 offering a chance for the next generation of bike enthusiasts to enjoy a range of activities. Like last year, specialists from the trail building industry, the bike industry and public organisations will get together after the Traillove Festival to attend the Trail Building Summit from 23-24 September 2019. As well as sharing the latest knowledge about trail building, the summit will discuss topics including coexistence and the importance of trail infrastructure for the development of the sport. The aim of the summit is to strengthen international expertise and encourage networking to ensure that the trail building industry continues to develop and improve.